I'm not much one for plugging tools here, but every once in a while, one comes in the door that I really like. When that happens I like to share my good fortune ... This Worksharp grinder arrived last week and immediately went to work. Everyone likes the control and ease of use and the air cooled grinding feature. All in all, it's a winner and we're feeling sharper everyday. When your grinder craps out, give this one some consideration. 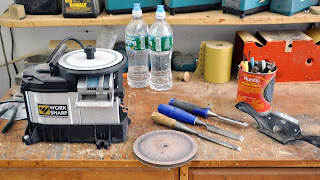 I've just started sharpening my own tools and went the wetstone route. It is a little labor intensive, but I figured it was an affordable to start in on the task.